I know from personal experience what it means to be diagnosed with a supposedly incurable disorder. When I was 26 I had my first epileptic seizure — the result of a concussion (head trauma) that I had received in an ice skating fall. I lost my driver's license, my job — and my dignity. Those first years were like a scene out of a horror movie for me. People began treating me as if I were mentally incompetent. I decided to fight back. I realized that instead of really living, I was only "non-dying." I couldn't undo the skating accident, and since medication wasn't working for me, I looked for other options and discovered alternative therapies and complementary treatments that did work. In my book, The Challenge of Epilepsy, Complementary and Alternative Solutions, I describe the various methods that helped me take control of my life and end my seizures. I found help from alternative therapy such as stress management, yoga, nutrition, biofeedback, music, and affirmations — and I have been free of seizures for 18 years with no medication. My personal and professional experience with epilepsy has given me many answers. For many years I practiced as a certified biofeedback therapist, specializing in epilepsy. And now I have returned to my first love — music. 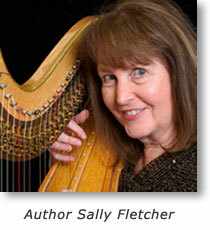 I perform and record music from the harp. I perform most of my music from memory, something I could not do when I was having seizures. I've discovered that the ethereal sounds of harp music can provide relaxing and healing vibrations for the body, mind and soul. I hope my journey and my book can be a help to you or someone you love. I have learned that great things are possible, no matter what "they say" to you. "...serves the dual purpose of educating the general public...and of helping the epilepsy sufferer and family members cope." Information on this website and in my book is meant to be educational in nature and is not designed to instruct anyone in complete self-treatment, let alone diagnosis. These are "extra" or complementary alternative treatments for epilepsy that you can learn about and do to help yourself. Consult your neurologist for information and questions about medication and surgery.